A recent study has measured the sensitivity to Arctic marine mammals to climate change. The study found that the three species most vulnerable to climate change are the hooded seal, the polar bear, and the narwhal: the common thread between these species being the loss of sea ice. The narwhal, a strange cetacean with a long tusk—unicorn-like—at the end of its snout, depends on cod, which live under ice-enclosed seas. 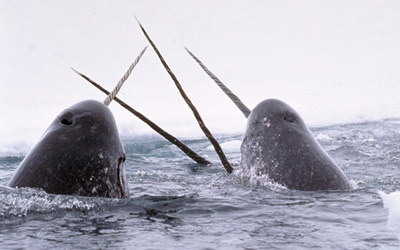 The also narwhals spend winters amid the sea ice, which helps them to avoid predators like the orca. Currently, the population of narwhals is unknown, but they are not a common sight in Arctic waters. The hooded seal also spends the Arctic winter. It uses the sea ice as a birthplace and nursery for their pups. Hooded seals are currently listed by IUCN as ‘least concern’, but that could change if sea ice continues to diminish at current rates. The polar bear has become a poster-child for climate change. The loss of sea ice means a loss of prey for the world’s largest bear. To survive, the animal would have to adapt different hunting habits. The Bush Administration is currently considering placing the polar bear on the Endangered Species List; the administration, to the frustration of environmentalists, has twice delayed the decision. Researchers believe conservation measures may help these species, but the only real solution is to tackle the sources behind global warming.